Have you ever heard those terrifying words and thought "How is it possible ?". And I was one of them for a long time. The only chocolate I liked was the one for the kids with white chocolate and milk chocolate. At home, the Eastern chocolate eggs were so happy to meet the Bredeles (Christmas shortbreads :). The years passed and my taste evolved slowly to sweets. I became a real chocolate and desserts addict after my pregnancy, yes ! Now I love chocolate so much ! Wonder which chocolate to use ? Depending on the country you live, there are different types of chocolates. Try this recipe with dark bittersweet chocolate first, even if you don't like to eat dark chocolate. The taste of chocolate is more smooth when it's cooked. I used unsalted butter, but the next time I'm going to use half salted and half unsalted butter for more taste. 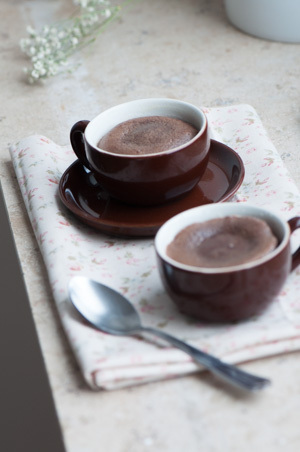 In this recipe I used these lovely little porcelain cups, that's why the oven temperature was fixed at 180C (356 F) . You can also use verrines (glas jars) and adjust the temperature to 140C (284F). The taller the jar, the better the fondant au chocolat will be. Luscious and super chocolat-y molten chocolate cake. Prepare and weigh all the ingredients listed above. Butter and lightly flour the cups. Tap out the excess flour. Clean the edge of the cups with a paper towel. Set the cups upside down on a baking sheet, and store in the fridge. Break the chocolate into big pieces. Cut the butter into big chunks. In a medium microwave friendly bowl, melt the butter with the chocolate using the microwave. Do it two or three times until you know exactly how long it need to melt them. For me it was 50 second at 1200 Watts. This can vary if you change the ingredient quantities. Stir with a spatula until smooth. In the bowl of a stand mixer fitted with paddle attachment, mix together the eggs and sugar at low speed (Kitchen Aid sped 2) during 3 minutes. We don't want to add air. Add the chocolate/butter mixture to the eggs/sugar blend. Stir slowly with a spatula. Add the flour in one time, and stir slowly with a spatula. Spoon the batter into the prepared cups. Clean the sides with a paper towel if needed. Store in the fridge (30 minutes to one day), covered with plastic wrap. Preheat the oven to 356F (180C). Bake in the oven for 10 minutes, or until the sides of the cakes are firm and the center are soft. Remember to stay near the oven the first time you bake them. I like to butter and flour the jars for an extra crunchy crust. I would recommend to stay near your oven the first time you cook those molten chocolate cakes, and each time you change the jar, because the cooking time may vary. This recipe is the perfect one to make ahead. Store the batter in your fridge, in the stand mixer bowl or in the jars/cups as you prefer, always covered, and cook in the oven when needed. You can also freeze the cakes with the cups. Simply use your microwave to warm up the cakes. The time may vary depending on the jars/cups you use. For example, in this case I used 100 ml porcelain coffee cups (the volume was measured with water). The side of the cake was warm and the center melting after 20 seconds at 750 Watts. NEED MORE THAN JUST A VIDEO ON YOUTUBE AND A RECIPE ON A FOOD BLOG TO MASTER THE French molten chocolate cake?